A boozy reveller who crashed into a railing and left his vehicle has been banned from the road for 17 months and ordered to pay £235. Chesterfield magistrates’ court heard on Wednesday, April 18, how Brandon Ruddiforth, 19, of Peggars Close, Barlborough, collided with railings on Brimington Road, Chesterfield, and was later arrested at his home. Prosecuting solicitor Lyn Bickley said: “The circumstances are that on March 30, at 3am, police attended Brimington Road, Chesterfield, after a report that a car had hit railings at the side of the road. Police were forced to attend Ruddiforth’s address about 3.20am and the defendant told them he had been driving and that he believed he was over the limit and he accepted that he crashed the car and another driver gave him a lift home. The defendant told police during an interview that he had been out in Chesterfield town centre with friends and had consumed four to five pints of lager and he left the bar at 2am and got into his car with the intention to drive home. Mrs Bickley said he had travelled 100 yards out of a car park before he crashed into the barrier and he accepted to police it was a stupid idea to drive but thought it was going to be cheaper than getting a taxi. Ruddiforth pleaded guilty to exceeding the alcohol drink-drive limit after he registered 72microgrammes of alcohol in 100millilitres of breath when the legal limit is 35microgrammes. Defence solicitor Annette Thomas said Ruddiforth had been distressed and he had flagged down another driver to help him but neither knew where the police station was so the other vehicle took him home. Ms Thomas added that Ruddiforth accepts it was a stupid thing to do but he thought he would have been okay to drive. Magistrates fined Ruddiforth £120 and ordered him to pay £85 costs and a £30 victim surcharge. 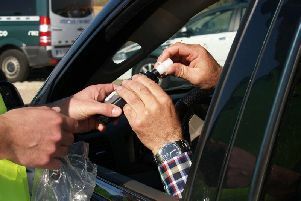 The defendant was also disqualified from driving for 17 months but if he completes a drink-drive rehabilitation course the ban can be reduced by 18 weeks.